Are you interested in a free session and tour of the facility? Brazilian Jiu-jitsu (BJJ) is also known as the “gentle art” and involves manipulating an opponent’s force against themselves instead of confronting it with one’s own force. By teaching students different techniques and having them work in a wide range of common situations, they are able to make educated decisions, protect themselves and make physical progress. Muay Thai is a combat sport from Thailand that uses stand-up striking along with various clinching techniques. The word muay derives from the Sanskrit mavya which means “to bind together”. Website Design and Development by GetPhound. 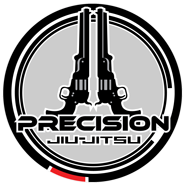 © 2015 Precision Jiu-Jitsu. All Rights Reserved.